Last week we were lucky enough to have a full day of inspirational talks at the IoD Women’s Directors Forum, held here at UKFast Campus. 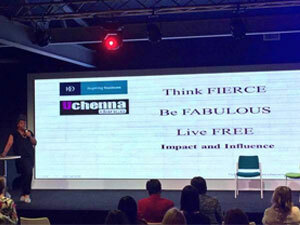 In today’s blog three of the amazing speakers share their thoughts on impact and influence. First up is the legendary Professor Dame Nancy Rothwell, President and Vice Chancellor at the University of Manchester. Nancy told us about how she only decided to apply for Vice Chancellor position the day before the application closed because she didn’t believe she could do the job. She talked about how, when a woman looks at a job application, she focusses on the things she can’t do. When Nancy made a list of the things that she could and couldn’t do in relation to the job spec however, she found they were equal – she realised that she could do it, and did end up getting the job. Her final piece of advice was to “grasp opportunities that give you a diversity of experiences. Then ask yourself if it’s going to be worthwhile and enjoyable”. But how do you get yourself into a position where you’re ready to have this kind of self-belief? Manchester Uni alumni, Dr Lee Williams of JOWSA consulting looked at the idea of Business Mental Toughness – a term that’s evolved out of the theory of mental toughness in sport. But business tasks aren’t like sporting tasks, which are often quite repetitive, and the impact you want to have on other people (i.e. your competition) is intimidation, rather than inspiration. When it came to focussing on business mental toughness there should be much more of a focus on leadership, which means that it’s your impact on other people that can set you apart in business. Lee suggested that to begin work on your business mental toughness, ask yourself how your decision making and behaviour influences and impacts others; then ask yourself how you can modify that style to inspire others more. Finally, write these reactions down which will help you clarify them (much like our CEO Lawrence’s thoughts on goal setting). One idea that both Nancy and Lee touched on is that we’re stronger together – something which Marian Sudburty of UKTI (that’s UK Trade and Investment to the likes of me) developed. Her advice was to know your story and be prepared to tell it in different ways which, she believes, is particularly hard for British people. She told us about how – when she was part of a small business – they had gone to a show trying to win a big bid; they had to make a stall using very little money so they set up a gazebo which displayed large cards showing information about the members of the team. This was different, and far more personal than the usual stand. It attracted loads of interest and they won the bid. She reinforced the idea that we need to get together with other people to make our stories stronger – that Manchester and the rest of the North are stronger together. To find out more about upcoming events at UKFast take a look at our events page!